The Hermes-Lite project aims to design and market a software defined radio transceiver that directly samples the antenna with an analog to digital converter, is completely controlled by Ethernet, and costs about USD 200. It is contained on a single 10x10 cm PCB. The standard enclosure is 10x15 cm and the extra space is meant for filters, transverters and other add-on boards. The Version 2 hardware includes a 5 watt push pull MOSFET amp as well as a 40 mW low power output. Since the FPGA and the digital up/down conversion is on-board, a sound card is not used for radio samples, and is only used for the microphone and for playing radio sound. The current version is 1.3 from March 2019. 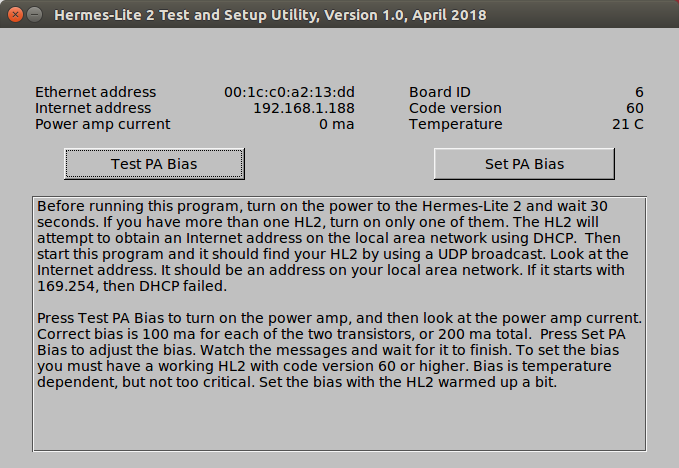 The Hermes-Lite 2 can be used with Quisk, PowerSDR, Spark SDR and other software that understands the original Hermes protocol. But it is necessary to set the power amplifier bias to 100 ma per transistor before the 5 watt amplifier is used. PowerSDR does not have that capability. And there is a need for a simple program that can find the HL2, display its address, and adjust the bias. So I wrote the hl2setup program. Here is a screenshot. Download the file hl2setup_win.zip. Open it and run the program hl2setup.exe. If it opens, you are done. If you get an error message about a missing file, run the program vc_redist.x86.exe and try again. If you get a warning message about an unknown app, click "More info". The hl2setup.exe program is signed, and you should see my name as the author. If you are curious, here are the details. The file hl2setup.exe is the program. It is not meant to be installed, so just run it where it is. It will probably end up in your Downloads folder. If you want to save it, move it somewhere else like your Desktop. To run a program on Windows, find it in File Explorer. Then double click it, or right click and select Open. The program requires some extra files that may or may not be present on your system. The file vc_redist.x86.exe is provided by Microsoft to install a package of files called "Visual C++ Redistributable". Go to Settings (or Control Panel), Apps to see the list of applications installed on your computer. You will probably have versions of this package installed already, but the versions may be old. The file vc_redist.x86.exe will install the 2017 version. You can uninstall the 2017 version using the same applications list, but there should be no reason to do that as other programs may need the files. Once the 2017 version is installed, you can delete vc_redist.x86.exe. Microsoft will update the installation as required. Download the program file hl2setup_ubuntu64.gz and uncompress it with gunzip. It is a 64-bit version that is known to work on Ubuntu and perhaps other versions of Linux. There may be other binaries in the future. But if it does not work, you will have to use Quisk or other software that can adjust the bias.